9 Kurtis SO Pretty That You Can Even Wear Them To A Party! “I have enough kurtis”, said no Indian girl ever. We can never get enough of kurtis, and with the beautiful designs that are readily available in the market these days, we just cannot stay away from them. It seems like a new and prettier kurti design comes along every new day and we are spoilt for choice. Designers are putting a modern spin on the kurti and it’s giving all the other tops and dresses a tough run for their money. 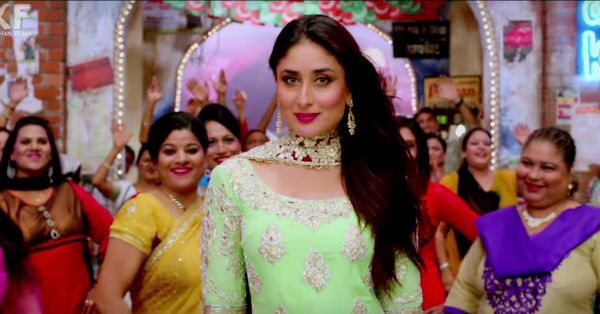 Here are 9 kurtis so glam, you can easily wear them to a party! 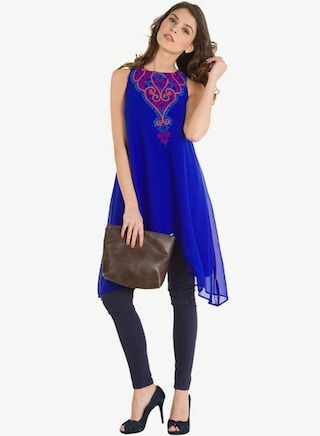 Get ready to break a few hearts in this gorgeous electric blue kurti. The flowy A-line silhouette teamed with a jewel neck makes this one an irresistible choice. Price: Rs. 499. Buy it here! When in doubt, wear red. The colour red instantly lights up your mood and makes you look attractive. This pretty kurti comes with the cutest pom-pom border and the keyhole neckline is to die for! Price: Rs. 480. Buy it here! Muted tones have a certain elegance and beauty about them. 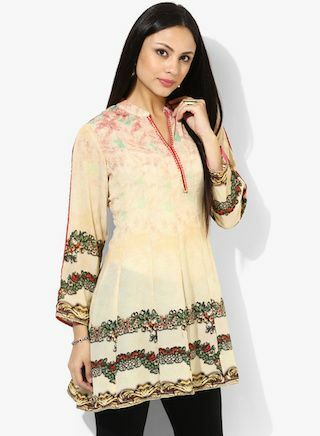 This cream kurti comes with a sequinned mandarin collar and the faded print gives it a unique character. There is absolutely nothing we don’t love about this one! Price: Rs. 999. Buy it here! If you have a semi-formal party to attend, then don this beautiful white kurti and make a style statement. The way the orange fabric has been used for the piping just elevates the style quotient of your outfit. The low-high design adds a trendy spin to it! Price: Rs. 769. Buy it here! If you want to turn a few heads while looking your ethnic best, then this is the right kurti for you. The Ikat print is timeless and the plain sleeves with the cut-out neck design add the perfect amount of jazz. Pair it with chunky silver earrings. Price: Rs. 899. Buy it here! 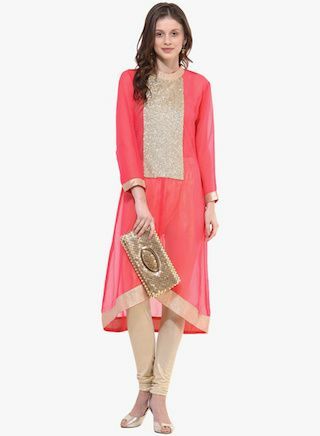 Shine like a star in this pretty coral kurti. The closed neck and the embellished geometric print makes this kurti a wonderful amalgamation of traditional and contemporary. Price: Rs. 650. Buy it here! We absolutely adore this asymmetric kurti! It’s chic and looks great on every body type. 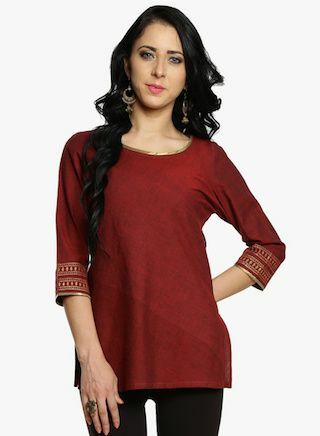 And the best thing about this kurti is that you can easily wear it as a dress with a pair of simple flat sandals. Price: Rs. 650. Buy it here! This long kurti with high side slits is all you need to elevate your style game to a whole new level. The closed high collar balances out the sheer bottom perfectly. Wear it with with a pair of wide legged trousers for an amazing yet comfortable look! Price: Rs. 875. Buy it here! 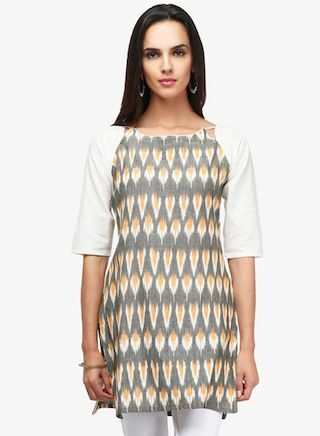 And if you’re someone who is not into a lot of prints or bling, then opt for this solid kurti. The rich colour complements the golden accent beautifully and makes it classy and elegant. Price: Rs. 1,099. Buy it here!